Many people are familiar with Beatrix Potter (1866-1943), the English creator of the beloved Peter Rabbit picture books whose illustrations and naturalism still hold a place in anglophone children’s literature. However, many Americans readers do not know about Swedish author Elsa Beskow (1874-1953), the “Beatrix Potter of Scandinavia.” Both women focused heavily on illustrations of their homeland’s natural landscape and both women were successful authors and illustrators at a time when those fields were dominated by men. Coincidentally, Beatrix Potter’s debut work The Tale of Peter Rabbit and Elsa Beskow’s career-making Peter in Blueberry Land [Puttes äventyr i blåbärsskogen] were both published in 1901. 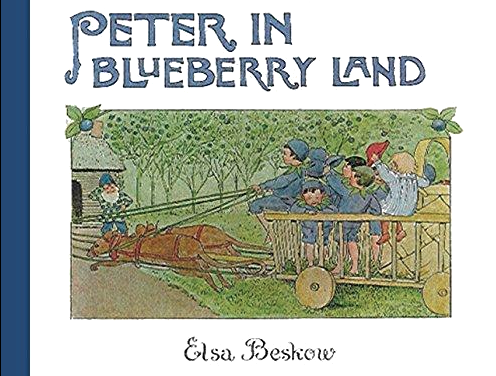 Upon publication of Peter in Blueberry Land, Elsa Beskow started a career in which she would publish 31 picture books and would gain lasting fame in the minds of Swedish children. United States. The relative anonymity of Beskow within the borders of the United States does not mean that Beskow is the lesser writer or illustrator, merely that her skill has not had the opportunity to reach far beyond Sweden. Her books hold a vital place in Scandinavian literature, education, and childhood understanding of nature. Though the experience of Beskow’s books is hindered by a language barrier, children in the United States who encounter her texts will not only learn about Scandinavian culture, but also about the natural world around them. Even though Beskow has been criticized by some for her depictions of upper class life in 20thcentury Sweden in books such as Aunt Green, Aunt Brown, and Aunt Lavender [Tant Gron,Tant Brun,och Tant Gredelin], her illustrations are drawn from personal experience and contain the earnestness of authenticity. Aunt Green, Aunt Brown, and Aunt Lavender are modeled after Beskow’s aunts who raised her after the death of her parents. After she studied drawing at Konstfack, University College of Arts, Crafts and Design, Beskow married Nathaniel Beskow in 1897 and had six sons who also served as models for many of her characters. Forced to draw her illustrations and compose her rhymes in the middle of the house, Beskow was still able to create precise detail despite the distractions caused by her family. For a reader from the United States, introduction to Beskow’s illustrations can become not only a source of entertainment, but also a source of education. Beskow’s picture books introduce the reader to a foreign culture which many children may not have the chance to encounter. Her unique view of Swedish life and the natural world is integral to the Swedish cultural consciousness. Many children are introduced to Beskow at an early age and they absorb her depictions of Sweden into their identities. As Margareta Bynning explains in Art Bulletin of Nationalmuseum Stockholm (2002), “Her images, especially of the forest, have had a great impact on many Swedes’ conception of nature” in part because “she portrays nature from the child's perspective: the forest with its rich vegetation towers in front of the viewer.” This type of illustration immerses the child-reader in the environment Beskow creates, encouraging participation in the Swedish landscape. Like Peter in Blueberry Land, which presents a microscopic kingdom hidden within the natural world, Woody, Hazel, and Little Pip [Nutta och Pillerill] is also depicted in miniature. Beskow’s focus on small woodland animals who interact with equally small hazelnut children—members of society constantly at a disadvantage because of their size—empowers the child and allows him or her the opportunity to subconsciously learn the human role in the environment. Furthermore, Beskow offers the reader practical, factual knowledge of the Swedish landscape as local plants play a prominent role in her illustrations. For example, lingonberries are featured in Peter in Blueberry Land, but this fruit is not widely available or used outside of Sweden. Other picture books, such as Ollie’s Ski Trip [Olle’s Skidfärd] and Around the Year [Årets Saga], educate the reader about the seasons and animate the forces behind the weather into accessible characters such as King Winter, Jack Frost, and Mrs. Thaw. Though Beskow’s illustrations are botanically accurate and provide such factual knowledge, her stories contain the right amount of fiction to make them entertaining for both children and adults. Beskow’s addition of magical elements such as fairies and trolls into her picture books sets her works apart from the anthropomorphized animals of Beatrix Potter’s Peter Rabbit. This fairytale-like element does not make her depictions of nature any less reliable, however. Her works are based in reality, enabling her to educate readers about the world around them, but the addition of magical aspects of inanimate nature are integral to the Swedish-ness of her work. Without Beskow’s addition of the magical, her texts would cease to be “typically Swedish” as Bynning describes them. 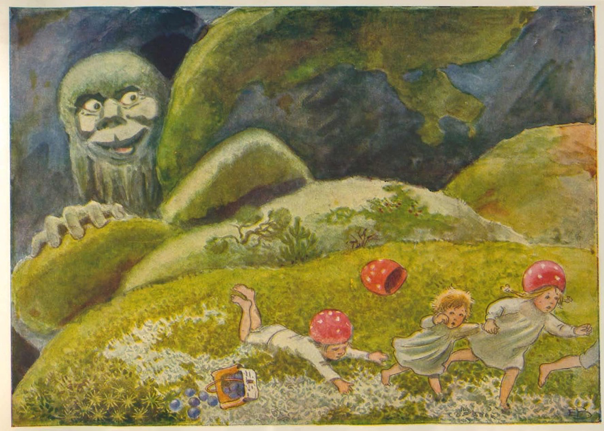 In Children of the Forest [Tomtebobarnen], the troll adds a layer of enchantment to the story, and encourages the children to play in the natural environment. Folkloric figures like trolls and fairies are a major part of Swedish culture and, as a result, must feature in her books alongside the reality of the natural environment. Especially in a climate in which environmental awareness is becoming more and more of a contested topic, authors like Beskow who allow the child-reader to encounter nature through the page have a renewed and vital role in the sphere of children’s literature. 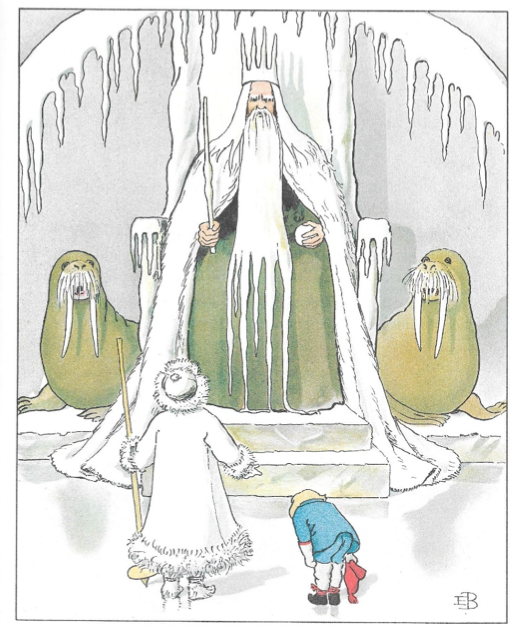 Increased recognition of Elsa Beskow will also help to illuminate the value of an international and magical-realist perspective within Anglo-American children’s literature. Her picture books work in tandem with Peter Rabbit and her influence has inspired and paved the way for other Scandinavian writers who have wider recognition such as Astrid Lindgren, the author of the Pippi Longstocking series, and Tove Jansson, the creator of Moomin. Though it has been a hundred years since the publication of Peter in Blueberry Land, Elsa Beskow and her illustrated Swedish landscape can and should obtain a place on American bookshelves.